Hillcrest Commando was a light infantry regiment of the South African Army. 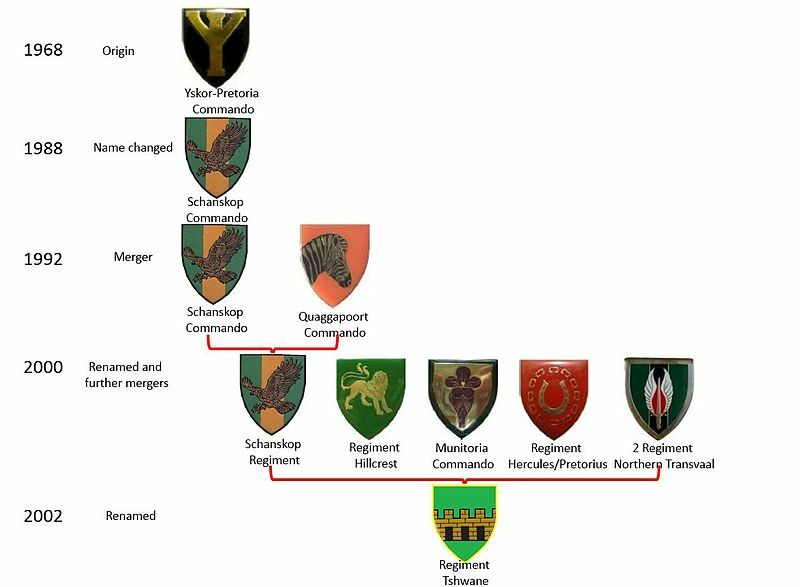 It formed part of the South African Army Infantry Formation as well as the South African Territorial Reserve. Hillcrest was a Commando from 1962 to 1983 and was the first English commando in Pretoria. Hillcrest was however a Regiment from 1983 to 2003. Hillcrest was an exclusive English speaking unit, but on the Minister of Defense’s persistence that they should speak both official languages it was decided to ” instead of one tail, our lion will have two tails as the Minister insisted”. This is a play on words as the Afrikaans word for languages is Tale. As a commando, Hillcrest deployed as far north as Rhodesia. Hillcrest became a Regiment in 1983 whereafter it did border camps in the Far North Command. In March 1994, the Regiment supplied platoons to assist the SADF in resolving the AWB/Bophuthatswana civil unrest. In April 1994, the Regiment called up 3 companies for duty in the East Rand and Johannesburg after the 29 March Shell House massacre. The Regiment was part of the first National Defence Force parade held in Pietersburg on 11 November 1994. In December 2002, Regiment Hillcrest with other structures in the Greater Pretoria area was amalgamated into the new Tshwane Regiment. 1st Permanent Force Artillery Battery S.A.M.R. 2nd Permanent Force Artillery Battery S.A.M.R. 4th Permanent Force Artillery Battery S.A.M.R. Transvaal Horse Artillery, attached S.A.M.R. This South African military article is a stub. You can help Wikipedia by expanding it. This page was last edited on 14 March 2019, at 22:13 (UTC).